Press Release From: Transformational Space Corp.
Three weeks of flight tests over the Mojave desert have demonstrated a breakthrough in how to safely launch future passenger-carrying rockets using a carrier aircraft. 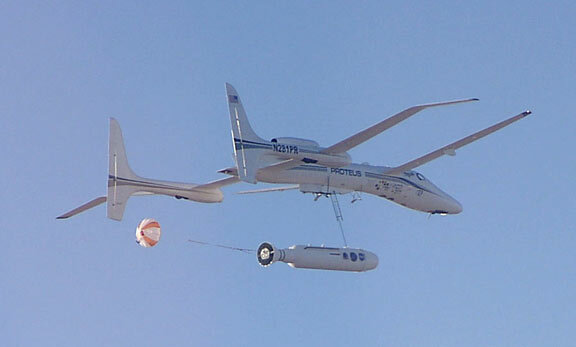 Transformational Space Corp. (t/Space) and Burt Rutan's Scaled Composites drop-tested dummy boosters from an aircraft using a technique that caused them to rotate towards vertical without requiring wings. This allows an aft-crossing trajectory in which the rocket crosses behind the aircraft, greatly enhancing safety. Previous air-launched rockets such as the X-15, Pegasus and SpaceShipOne crossed in front of the carrier aircraft using wings to turn themselves from horizontal flight to the vertical position needed to achieve orbit. In addition to greatly enhancing safety, eliminating the weight of wings increase the payload the rocket can take to orbit. The innovation developed by t/Space is a special mechanism that holds on to the nose of the booster for about a half-second after the center of the rocket is released. This slight tug on the nose starts the booster rotating as it drops. 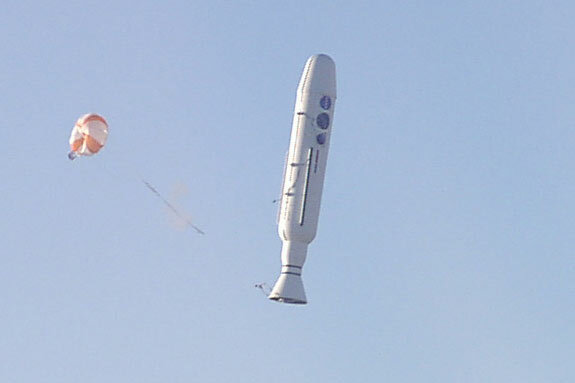 A small parachute on the rocket's nozzle ensures the rotation happens slowly. The dummy booster dropped today was the third and final in the t/Space program, with previous drops on May 24 and June 7. All test articles dropped were inert - two steel tanks welded together with a Fiberglas nose and nozzle. They were 23% of the size of the actual rockets to be developed for sending a four-person capsule into orbit. Since they had no engines, each eventually crashed onto the dry Cuddeback Lake, about 35 miles northeast of Mojave, CA. The wreckage was collected and removed. t/Space is one of eight companies funded by NASA's Exploration Systems Mission Directorate to develop concepts for the agency's Crew Exploration Vehicle (CEV) that will take over non-cargo duties from the Space Shuttle. NASA agreed to let t/Space use some of its $3 million second-phase study money to build and test hardware in addition to conducting analytical studies. The successful drop test program shows that small companies using rapid prototyping can deliver new hardware very rapidly. "We went from brainstorm to booster drop in just 135 days," said David Gump, president of t/Space. "Program manager Marti Sarigul-Klijn proved that his computer simulations were dead-on correct each time the aircraft dropped the dummy booster." Bob Morgan managed the Scaled Composites side of the test program that demonstrated the new air launch method, called Trapeze-Lanyard Air Drop (t/LAD) launch. This approach greatly improves simplicity, safety, cost, and reliability of launching personnel into low Earth orbit. Photos of the flight tests are available at www.transformspace.com/media and a full technical description of the drop test program will be posted at the Web site on June 16. Transformational Space Corporation LLC is a small innovative company developing vehicles for the Vision for Space Exploration. Contractors on the t/Space team include: Scaled Composites Inc., which made history last year by rocketing the first civilian pilot into suborbital space aboard SpaceShipOne; and AirLaunch LLC, which is under contract with the Defense Department to develop a low-cost responsive launch vehicle.